Manufacturer of a wide range of products which include schneider lexium 28 ac servo drives, schneider lexium 23 ac servo drives and schneider lexium 32 ac servo drives. 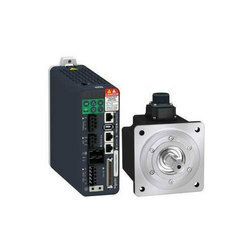 The Schneider Lexium 28 AC Servo Drives is defined by AC-servo drives LXM28 for combination with AC-servo motors BCH2. The Lexium 28 range offers predeterminated combinations to suit the requirements of motion control applications, and optimize installation’s performance. The Lexium 28 servo drives are delivered without EMC filter, the EMC immunity is reached with additional EMC filter. The Lexium 28 servo drives have degree of protection IP20. BCH2 motors provide a nominal torque from 0.16 Nm to 28.6 Nm and a nominal speed of from 1,500 to 3,000 rpm, depending on the model. They are suitable for a wide variety of applications due to the different levels of motor inertia offered. The compact dimensions of Lexium 28 servo drives mean they fit very easily into small spaces, thus reducing the size of the installation and the cost of the equipment. 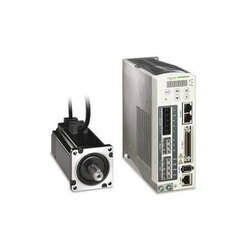 The Schneider Lexium 23 AC Servo Drives offer features a range of servo drives and a range of BCH servo motors. BCH motors provide a nominal torque from 0.3 Nm to 48 Nm and a nominal speed of between 1000 rpm and 3000 rpm, depending on the model.They are suitable for a very wide variety of applications due to the four levels of inertia offered. The Schneider Lexium 32 AC Servo Drives of servo drives includes three servo drive models associated with two servo motor ranges for optimum use which can adapt to demands for high performance, power and simplicity of use in motion control applications. It covers power ratings between 0.15 and 7 kW.The Lexium 32 servo drive offer is designed to simplify the life cycle of machines. The SoMove setup software, SoMove Mobile software, side-by-side mounting and colour-coded plug-in connectors, easily accessible on the front panel or on top of the servo drives, all make installation, setup and maintenance easier. Maintenance is also quicker and cheaper thanks to the new duplication and backup tools, such as the memory card.Performance is improved by optimized motor control: reduction of vibration with automatic parameter calculation, speed observer, additional band-stop fi lter. This optimization increases machine productivity. 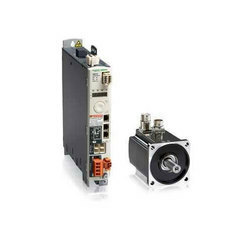 The compact size of the servo drives and servo motors provides maximum power in the minimum space, enabling the machine dimensions and costs to be reduced.Integrated communication or optional communication cards, depending on the model, as well as standard encoders, enable adaptation to numerous types of control system architecture for industry.Integrated safety function and access to additional safety functions reduce design times and make it easier to comply with safety standards. Printing: cutting, machines with position control, etc. Packaging and wrapping: cutting to length, rotary knife, bottling, capsuling, labelling, etc. Textiles: winding, spinning, weaving, embroidery, etc. Handling: conveying, palletization, warehousing, pick and place, etc. Transfer machines (gantry cranes, hoists), etc. Clamping, “on the fl y” cutting operations (fl ying shear, printing, marking), etc.